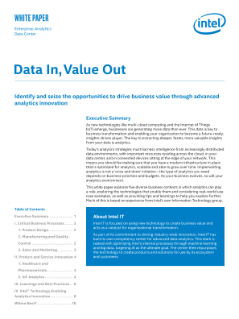 In today’s increasingly data-driven business landscape, the companies who succeed are typically those who are equipped to put their data to work most effectively. Data analytics has the potential to dramatically impact both internal critical operations as well as external product or service delivery and customer experience. This is made possible by creating faster, more in-depth insights that ...enable better decision making and provide a huge opportunity for IT to drive digital transformation across the business.